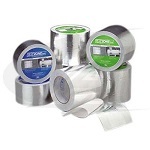 Specifically designed for welding, Aluminum welding tape is heat-resistant and has a halogen-free adhesive that is engineered for purging jobs on tube, pipe and large vessels. 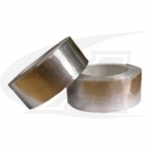 Our aluminum welding tape is commonly used to hold structures in place to facilitate tack welding and to cap off the ends of tubing and more. The material's glue backing is resistant to 392 degrees F. (200 degrees C.), Aluminum Tape resistant to 572 degrees F. (300 degrees C.). 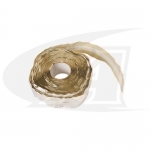 Engineered to improve weld bead profile, save purge gas and minimize down time. 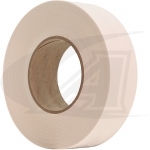 Our "fiberglass insulated" aluminum weld backing tape attaches to the backside of the weld joint making it ideal for welding thin sheet material, tube, pipe and large vessels. 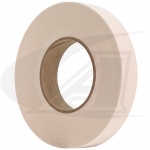 This specially engineered aluminum weld backing tape improves weld-quality and consistency by surrounding the weld area with shield gas, in most cases eliminating the need to back purge, while giving a consistent high-quality under-bead profile. 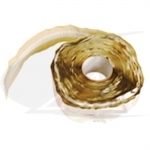 EZ Zone™ welding tape is used to seal the root gap between tube and pipe joints trapping weld shield gases. The tape is designed to be wrapped around the joint, which is then purged with shield gas. Operator's simply peel back a section of tape exposing the joint to begin welding. Shield gas flows out of the exposed area ensuring no atmosphere enters the joint. 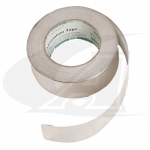 This engineered aluminum welding tape includes two halogen-free adhesive areas on the outside edges, and an adhesive-free center "Zone".